If one of your stops in France is Paris, you’ll definitely need to get our 4-Day Paris Itinerary! Saint Malo is perched on Brittany’s coast, in northwestern France. The tall, granite walls that surround the old town invite visitors to discover the city’s rich history. Known for its independent streak, the city was long a stronghold for privateers (pirates the king approved of). It’s also the hometown of explorer Jacques Cartier and René Dugyay-Trouin, famous French corsair or “sea dog”. The imposing Saint Malo Cathedral features beautiful stained glass windows depicting Saint Malo’s exciting past. Now you might be wondering why you’ve never heard of this town before and what to do in Saint Malo. We’ll be sharing some of our favorite attractions and tell you about traveling from Paris to Saint Malo. Take a stroll along the ramparts to enjoy beautiful views of the harbor, the Solidor Tower and the Petit Bé, a tidal island just outside the city. Immerse yourself in the maritime culture of one of Brittany’s most popular tourist destinations. Saint Malo is also a culinary hot spot. Make sure to taste regional favorites including fresh seafood, locally made Cider, MALO brand dairy products and the world-famous Maison Bordier butter used in Michelin-star restaurants around the globe. And for all you shopaholics out there, Saint Malo’s cobbled stoned streets are lined with many fantastic shops, including independent boutiques. 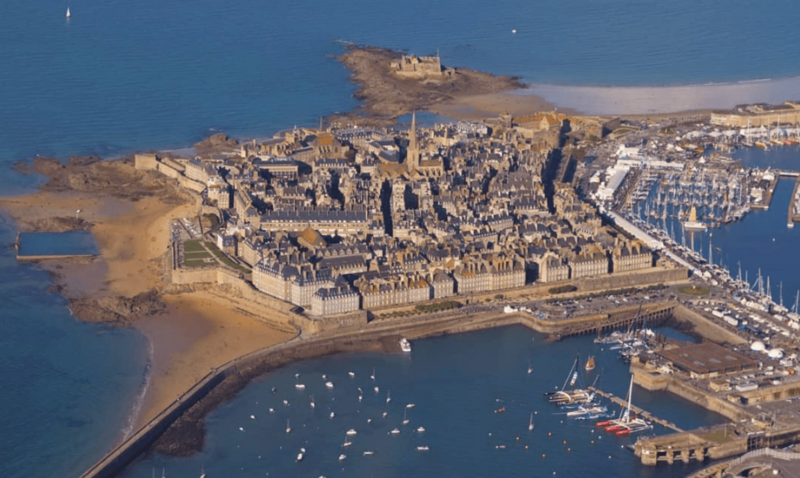 Saint Malo is a great destination to visit all year round thanks to its temperate, maritime climate. 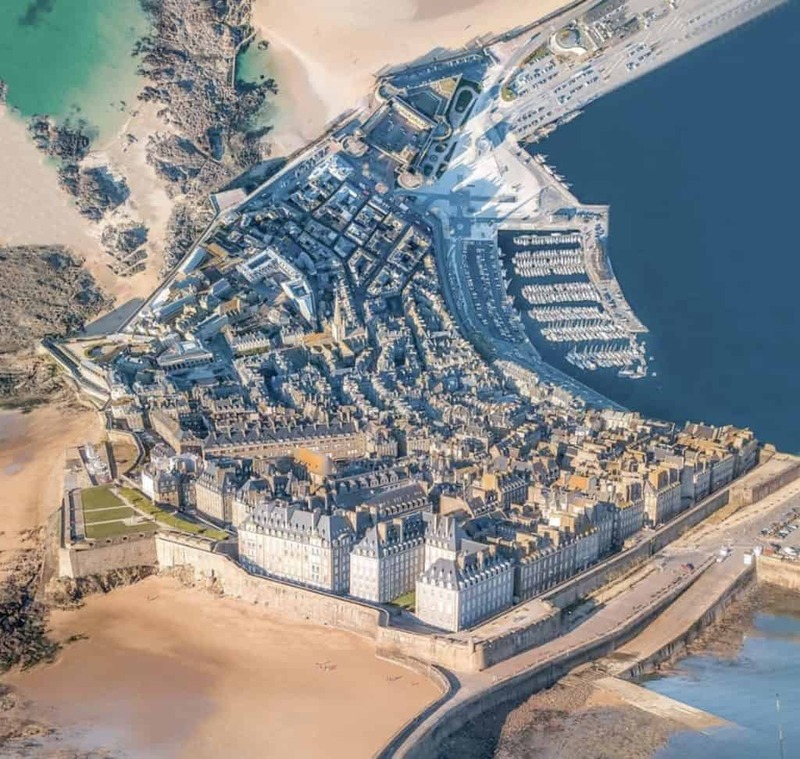 With temperatures up to 20°C, July and August are especially good months to visit Saint Malo. However, it’s also peak tourist season, so expect crowds. To thoroughly enjoy the cobbled streets of Saint Malo’s old town, get an authentic glimpse into Brittany’s rich sea-faring past and taste some of the many regional culinary specialties, we recommended staying for at least two full days. However, if you are on a tight schedule, it is possible to see the main sights in just one day. If you are going to walk up the ramparts or around the cobbled streets of old town, make sure to wear comfortable shoes. Other than that, there is no specific recommended dress code for Saint Malo. So simply plan on dressing for the season. Make sure to visit the Saint Malo Cathedral (Cathédrale Saint Vincent de Saragosse de Saint Malo). It’s a French national monument, whose impressive spire can be seen from miles away. The Cathedral boasts Roman, Gothic and Renaissance styles for a truly unique architectural mix. In 1944, during the battle for the city, the choir section of the churched was bombed and took over 20 years to repair. 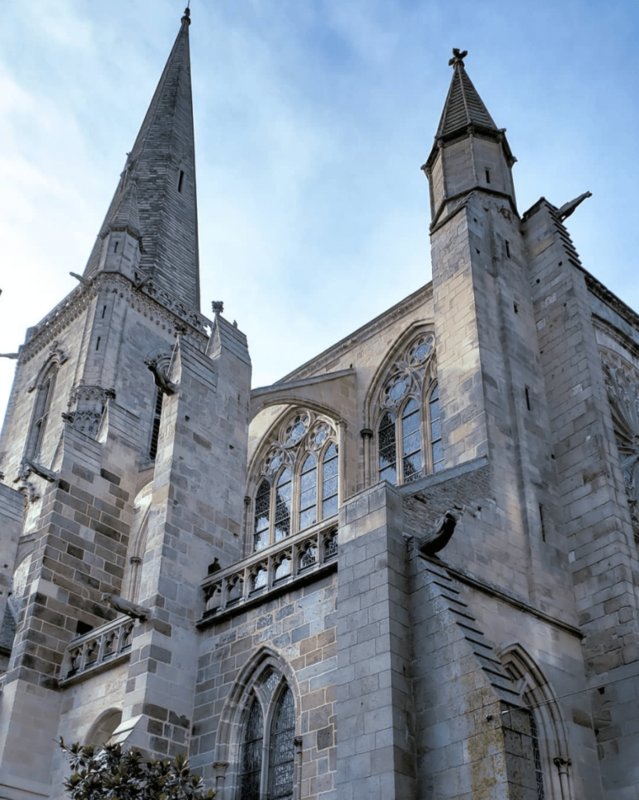 And while there are many other beautiful churches in France, Cathédrale de Saint-Malo stands out because of its location–right in the middle of the city’s ramparts from where you’ll get a nice view of the the surrounding buildings. 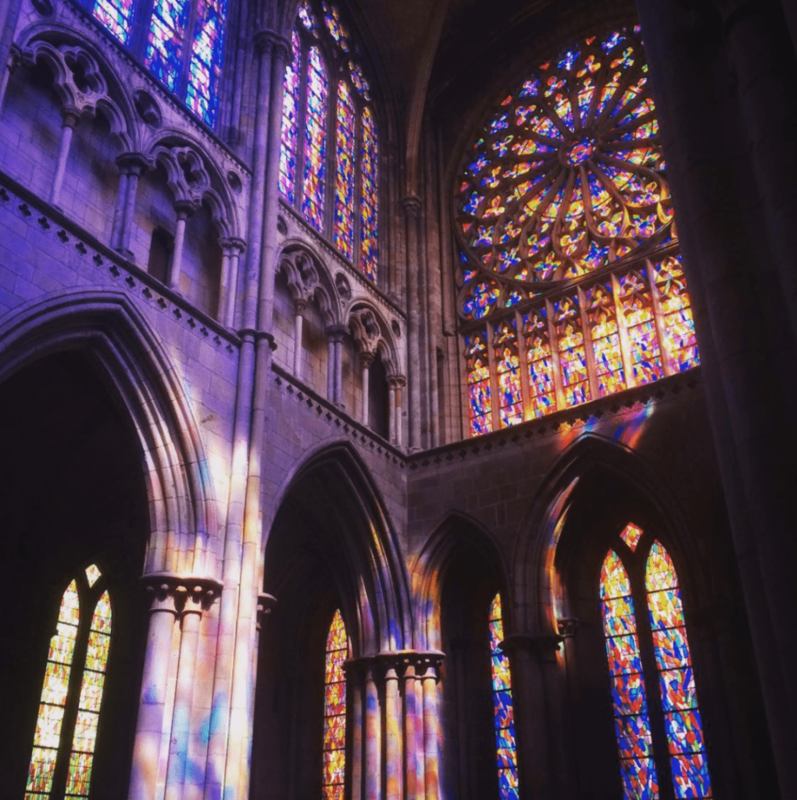 You’ll also admire the beautiful stained glass windows of the church that reflect light in different colors. The Château de Saint Malo was built by the dukes of Brittany in the 15th and 16th centuries and formerly symbolized their royal power. The historic site is now home to the town museum, Musée de Saint-Malo, where you can learn about the history of Saint Malo. The great keep and the castle watchtower provide stunning views of old town, the port and the coast. It’s particularly beautiful at sunset. Solidor Tower is located in the former town of Saint Servan, which was merged with Saint Malo in 1967. 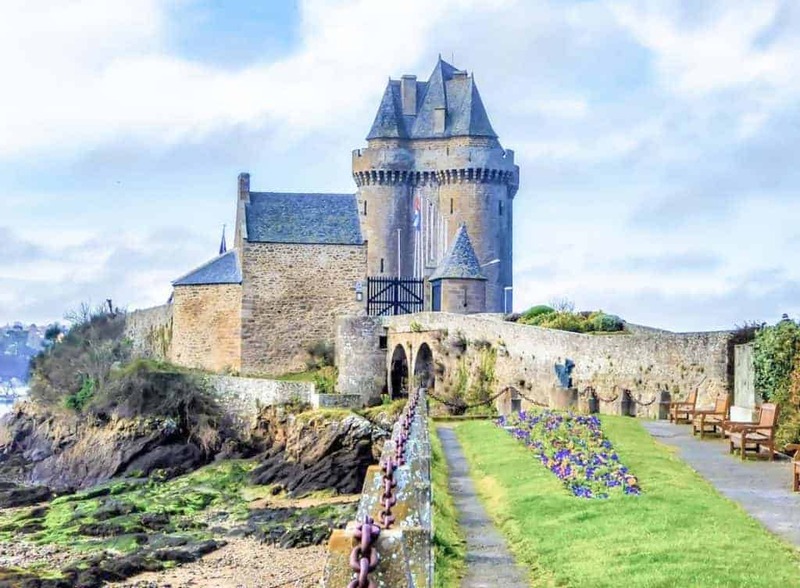 Built in 1369, the strengthened keep features three linked towers that overlook the harbor and was originally constructed to control the town of Saint Malo, because they refused to recognize the authority of Saint Servan. Before being turned into a museum, the tower was briefly used as a prison. 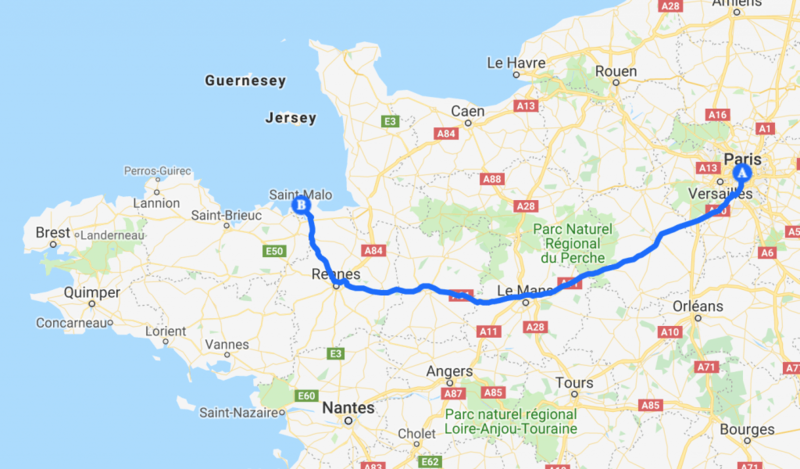 Driving from Paris to Saint-Malo would be an exciting journey to make! You’ll be able to make stops as you like and even stop by its big city of Rennes. The drive will take at least 4 hours (415km) but it can be fun, especially with good company! If you haven’t driven in France before, you might find it useful to read our complete guide about renting a car in France and and driving here. 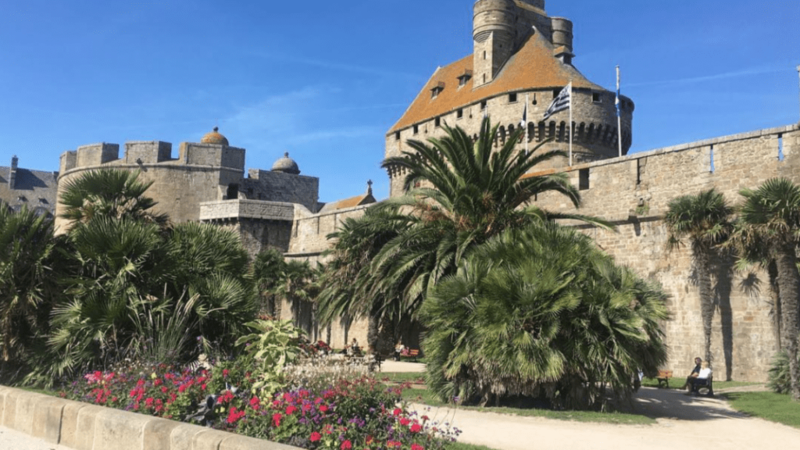 Though we like encouraging travelers to explore France by car, we think taking the train from Paris to Saint-Malo might be the better and faster option. SNCF runs 7 trains per day between Paris and Saint-Malo and with one train change at Rennes station. Going to Saint-Malo from Paris is also an option. However, the bus service is only available of Saturdays and Sundays as Saint-Malo is often a weekend getaway for most Parisians. The bus that departs from Paris-Bercy station station will take 6 and a half hours, whereas the bus that departs Paris-La Défense will take just under 6 hours. Book your bus ride here.